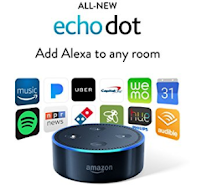 Currently, Amazon is offering their Amazon Echo Dot 2nd Generation in black or white for only $39.99! They're usually $10 more, so this is a great deal. These will ship FREE with any order over $49, or if you have Amazon Prime!